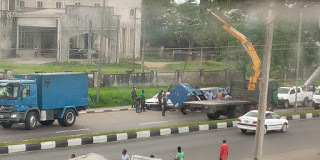 A Mobile Police (MOPOL) armoured vehicle escorting a Central Bank of Nigeria, CBN bullion van, Friday, crashed-capsided along Muritala Highway, Calabar, NegroidHaven Reports. An eye witness pleading anonymity disclosed that the incident happened close to the Zenith Bank section of the Highway as the armoured tank driver carrying a batch of police officers, usually driving at breakneck speed attempted to prevent a salon car which was attempting to overtake the convoy to continue in their path. In the attempt to unsuccessfully prevent the salon car the security vehicle dodged the now stubborn driver of the salon car and capsized. Incidentally, no casualty was recorded. While mechanical engineers are seen repairing the capsized vehicle to get it off the road. Meanwhile, the billion vans has been whisked off the scene of the accident. While the salon car has been identified and detained, the driver has escaped the scene reportedly. Onlookers have described the development where a CBN security car capsized on the metropolis as disgraceful. They had expected the security vehicle to jam the salon car. This incident occurred 25 minutes ago.